More than any other sport, baseball is a game of numbers. Statistics and records help measure the greats of the game against their peers – against generations – and this ever-evolving record book is what helps give baseball renewed life. But not every mark in the game is destined to change, for there are but a few that are indeed unbreakable. 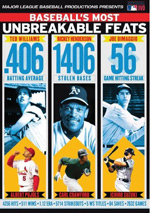 Legendary pitcher Roger Clemens narrates Baseball’s Most Unbreakable Feats DVD, a detailed look at 10 seemingly untouchable baseball achievements. They say records as made to be broken, but what if the numbers are so far out of reach that it becomes virtually impossible to eclipse them? That’s the notion examined in a program called Baseball’s Most Unbreakable Feats. Hosted by the legendary Roger Clemens, Feats discusses 10 of the sport’s most elite achievements. It uses lots of archival footage along with comments from President – and former Texas Rangers co-owner - George W. Bush, former President Bill Clinton, broadcasters Dave Niehaus, Joe Garagiola, historian/statistician Bill James, historians Jules Tygiel, Maury Allen and John Horn, Elias Sports Bureau’s Steve Hirdt, author Michael Seidel, Diamondbacks GM Josh Byrnes, managers Terry Francona, Sam Perlozzo, Joe Torre, Sparky Anderson, Lou Piniella, Bobby Cox, Mike Scioscia, Phil Garner, Tony LaRussa, Bud Black, John Gibbons and Joe Maddon, coaches Billy Hatcher, Curt Young, Larry Bowa, Leo Mazzone, Dave Righetti, and current/former players Nolan Ryan, Ron Fairly, Wes Littleton, Scott Kazmir, Dave Winfield, Mike Schmidt, Brett Myers, Mike Piazza, Jeremy Sowers, Coco Crisp, Brian Roberts, Tom Glavine, Eric Davis, Cal Ripken, Jr., Robin Yount, Alex Rodriguez, Kevin Millar, Troy Glaus, Craig Biggio, Tony Clark, Chris Ray, LaTroy Hawkins, Mike Flanagan, Casey Blake, David Ortiz, Aaron Boone, Kevin Youkilis, Pete Rose, Juan Pierre, Justin Morneau, Omar Vizquel, Luis Gonzalez, Dave Roberts, Paul Konerko, Ramon Hernandez, Doug Mirabelli, Jon Garland, Jeff Suppan, Brandon Webb, Mark Mulder, Adam Wainwright, Barry Zito, Greg Maddux, David Wells, Kirk Gibson, Chris Young, Derrek Lee, Lance Berkman, Ted Williams, Harmon Killebrew, George Brett, Kevin Kouzmanoff, Albert Pujols, Matt Holliday, Hank Blalock, Bill Hall, Brandon Backe, Joe Mauer, Bob Gibson, Jason Jennings, Nick Swisher, Willie Mays, Aaron Rowand, Noah Lowry, John Lackey, Dave Stewart, Lou Brock, Joe Carter, Maury Wills, Dontrelle Willis, Jose Reyes, Carl Crawford, Grady Sizemore, Scott Podsednik, Jimmy Rollins, Preston Wilson, Michael Cuddyer, Eric Gagne, John Smoltz, Paul Lo Duca, Shane Victorino, Tim Hudson, Wilson Alvarez, Mike Gonzalez, Chris Capuano, Joe Nathan, Brian Fuentes, Trevor Hoffman, Billy Wagner, Robinson Cano, Phil Rizzuto, Jerry Coleman, Bernie Williams, Mark Sweeney, Torii Hunter, Jason Varitek, Paul Byrd, Ray Durham, Joe DiMaggio, Eric Byrnes, Chase Utley, Alan Trammell, Fred Lynn, Ryan Dempster, Rich Aurilia, Jermaine Dye, Ichiro Suzuki, and Travis Hafner. 5714 Career Strikeouts – Nolan Ryan: Experts - very unlikely. Me - Agreed, though I think this is one of the documentary’s more vulnerable records. As the experts mention, the changes in the way pitchers are used makes it tough to get enough innings every year for tons of KOs, but I still don’t think this is an untouchable record. If anything, I believe Ryan’s seven career no-hitters is the more unattainable accomplishment. 2632 Consecutive Games Played – Cal Ripken, Jr.: Experts – probably not. Me – Not gonna happen. Some folks like to mention this one as breakable simply because Lou Gehrig’s original record of 2130 consecutive games played was viewed as absolutely untouchable for so long – until Cal. But just because one guy broke the streak 60 years later doesn’t mean someone else can or will ever do it. In a freaky twist, this section of the DVD became out of date before the disc hit the shelves. The show discusses Miguel Tejada’s 1100+ games streak as a potential challenge to Cal. However, Tejada fractured his wrist on June 20, 2007, and his streak ended. I think this leaves the most active current consecutive games streak at something like 350. 4256 Career Hits – Pete Rose: Experts – tough, but achievable. Me – I feel the same way. If you look at the numbers over the years, it does seem unbreakable. After all, only Rose and Ty Cobb got more than 4000 hits over their careers, so what are the chances someone else will join that club? However, I think this one’s breakable just because unlike many of the other records, it's not heavily affected by changes in the game. Many of the pitching records are almost impossible to top because managers don’t let pitchers throw as many innings as in the past. Hitters haven’t changed much, though. One could argue pitching philosophies hurt hitters; starting pitchers throw fewer innings, so hitters don’t get the same number of chances against the same guy and they face fresh relievers later in he game. On the other hand, we have more teams today than in Rose’s era, so the pitching pool is diluted, a factor that helps hitters. So that’s my long-winded way of saying this one’s vulnerable. If we someone with the same talent as Ichiro plays his whole career in the Major Leagues, this one could drop. 511 Career Wins – Cy Young: Experts – impossible. Me – agreed. Unless MLB all of sudden decides to drop five-man rotations and all the reliever specialization, this one’s absolutely untouchable. As one participant says, today’s pitchers could win that many but they’re not allowed to do so. That’s true, and that change in the game makes Cy Young’s mark the most unbreakable in baseball. It’s very unlikely anyone will get to 400 wins again, so it’s an absolute lock that 511 is safe for all-time. .406 Single Season Average – Ted Williams: Experts – maybe. 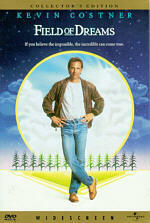 Me – breakable, and probably the most likely to fall of all 10 of this DVD’s records. .406 is an odd beast to mention here since it’s not really a record; other hitters have higher single-season averages than Williams’ 1941 percentage. It’s just the last time someone hit .400. I don’t know if I’ll ever see someone bat .400 again, but it does seem like a vulnerable record. Heck, if the 1994 season hadn’t ended early due to a strike, Tony Gwynn might’ve gotten there; he was at .394 in mid-August. Rod Carew and George Brett also have come close. Single-season marks are easier to break than career records, so I think .400 could – and probably will – happen again someday. 1.12 Single Season ERA – Bob Gibson: Experts – close to unbreakable. Me – I think it’s doable, though less likely to fall than .400. The crackdown on steroids is making hitters less formidable than in recent years, and the specialization in pitching can help starters; since they don’t have to throw as many innings, they can be fresher and have better stuff when they do pitch. I’m certainly not saying this one will fall, but a couple of small rules changes like a bigger strike zone along with a total stud pitcher could be enough to make it happen. 1406/130 Career and Single Season Stolen Base Totals – Rickey Henderson: Experts – extremely unlikely on both sides. Me – I don’t think anyone will touch Henderson’s career mark, but I feel someone could top 130 in a season at some point. All you need is one guy with the same kind of attitude and ability as Henderson to do it for one year, so this could happen. Since Henderson always seemed to me to be one of the game’s biggest jerks, I’d sure love to see his marks fall. I mean, what kind of egotist declares himself “the greatest of all-time” as part of his speech after he breaks the record? At least throw a little false humility our way, Rickey! 84 Consecutive Saves – Eric Gagne: Experts – vulnerable. Me – definitely possible to top. I’m always leery of an “unbreakable” record that was set so recently, especially if it isn’t a career accomplishment. When a mark has lasted for decades, it seems more insurmountable. But if someone just did it a few years ago, it doesn’t look all that special. Of course, what Gagne did was special, but I think it’s possible – and maybe even likely – someone else will top it. Managers really coddle closers these days, and the rules for saves mean that they’re not always pitching in true pressure situations. Gagne’s mark is probably the most vulnerable of the 10 on this DVD. As an aside, does anyone else think that Seth Rogen is a lock to play Gagne if they make a movie about the pitcher? Five Consecutive World Series Titles – New York Yankees: Experts – very unlikely. Me – definitely tough but doable. Again, I look at recent history to support my thoughts. The documentary doesn’t mention this, but the Yankees took four of five between 1996 and 2000. If the Indians hadn’t stopped them in 1997, they might’ve had all five. I agree with all the arguments against anyone getting to five in a row – too many teams, too many rounds of the playoffs – but if the Yanks could make it four of five in the last decade, why can’t someone go five for five? 56 Game Hit Streak – Joe DiMaggio: Experts – tough, but could happen. Me – not going to happen. As mentioned in the show, the specialization of relievers makes this one more difficult today than in 1941, and added media pressure would weigh on the player. While I’m usually open to the demise of single-season records, this one’s different since it requires you to have no slumps at all over two months. Any records that go for a full season allow some minor weaknesses, but this one forces you to be on your game every day for 56 straight. No one will do that again. Feats acts as a fun look at all of these great accomplishments. It moves through all of them at a good pace but still allows for a reasonable amount of detail to emerge. I worried that we’d just get comments that lavish praise and tell us little else, but we find some nice insights into the records. It’s good that we hear from so many ballplayers, since they’re able to put the topics into perspective. This turns into an entertaining little documentary. 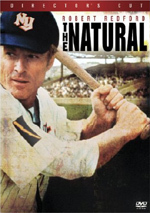 Baseball’s Most Unbreakable Feats appears in an aspect ratio of approximately 1.78:1 on this single-sided, single-layered DVD; the image has been enhanced for 16X9 televisions. Because Feats compiled material from such a wide variety of sources, it was virtually inevitable that the quality would be erratic. Nonetheless, the show usually looked fine. Without question, the modern interview snippets provided the most satisfying visuals. These consistently appeared clear and accurate, without any genuine concerns. They seemed concise and acceptably detailed, and they showed good colors and clarity. As for the other components, they were less steady. The various archival clips could be rough in terms of marks and other source flaws, and videotaped bits tended to be somewhat fuzzy and murky. However, I expected these issues and didn’t think they were extreme. The older shots had their problems but remained perfectly acceptable. The program’s editing style tended to make any picture quality concerns less noticeable. While not cut at a really hyperactive pace, the show didn’t stay with often stay with one shot long enough for me to pick up on different potential problems. Overall, this was a decent visual presentation. As for the Dolby Surround 2.0 soundtrack of Baseball’s Most Unbreakable Feats, it also was satisfactory. In terms of speech and effects, the mix usually remained focused on the front center channel. However, it opened up music to a good degree. The virtually constant score provided nice stereo imaging and also blended with the surrounds in a smooth manner. This wasn’t a dazzling soundfield, but it was more engaging than expected. Audio quality appeared fine. Of course, the occasional archival elements were erratic and sounded pretty scratchy, but the new interviews came across as warm and distinct. A few lines were slightly edgy, but they usually seemed natural and they always lacked problems related to intelligibility. The music appeared nicely bright and dynamic, and the effects displayed decent accuracy. This was a more than acceptable soundtrack for this kind of show. In terms of extras, we get four additional featurettes that look at other “unbreakable” records. These discuss “191 RBI Season” (2:13), “59 Consecutive Shutout Innings” (11:36), “Two Grand Slams In a Single Inning” (4:14), and “Back-to-Back No-Hitters” (5:45). All together, they fill 23 minutes, 48 seconds, and we get notes from Hunter, Varitek, Piniella, Swisher, Wilson, Rose, Smoltz, Garagiola, author Rich Westcott, Hall of Fame head curator Ted Spencer, HOF head researcher Tim Wiles, and players Marcus Giles, Mike Cameron, Orel Hershiser, Johan Santana, Fernando Tatis, Al Leiter, Randy Johnson, Buddy Hassett, Warren Spahn, and Johnny Vander Meer. As much as I enjoyed Feats, these featurettes make me wish for a “director’s cut” of the program. “RBI” is short and similar to the pieces in the main show, but the other three offer expanded, detailed looks at the accomplishments. I love that we see lots of footage of Hershiser’s record-breaking night, and we also watch Tatis’s two grand slam-hitting at bats. These featurettes are very enjoyable and make a nice addition to the set. The DVD opens with some ads. We get promos for The Great American baseball Box, MLB Bloopers – The Funny Side of Baseball, Pure Heat: Ultimate MLB Flamethrowers and MLB Superstars Show You Their Game. As a baseball fan, I find a lot to like about Baseball’s Most Unbreakable Feats. We see 10 of the game’s most amazing accomplishments and hear insights from the pros about them. The DVD provides perfectly acceptable picture and audio along with some useful extras. 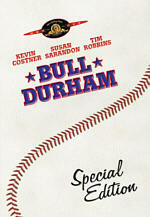 This is a good DVD for baseball buffs.